I just got back from the ACES: The Society for Editing conference in St. Petersburg, Florida. Hanging out with a large group (more than 590) of smart, funny editors is almost the perfect vacation. I say almost perfect because — in my capacity as one of the ACES board members and the website editor — I was super busy. That meant getting up before 7 a.m. and most of those editor friends could tell you I like to stay up until after 2 a.m. There wasn’t much in the way of sleep during the week. What made the experience even better is that the conference was in sunny Florida. I’m sitting here writing this in somewhat gloomy Kansas (it is still March) and so I miss the short-sleeve weather. 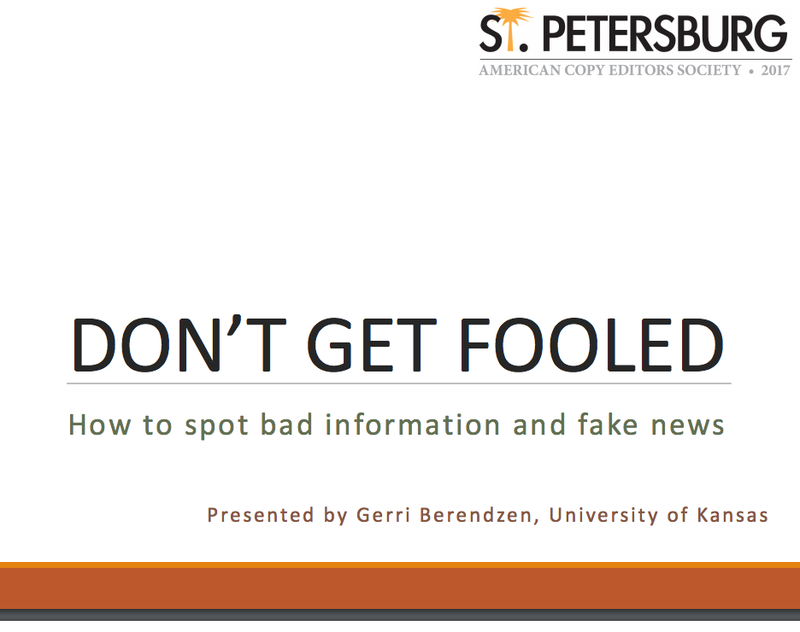 I presented a session on fact checking to what seemed like a full room. I can’t get you numbers I trust on actual attendance, and part of my spiel is that numbers are among the things editors should be most skeptical about. I’ll boil my presentation down to a couple of sentences. Sources tell writers things. Sometimes the sources say those things off the top of their heads. Sometimes the sources just don’t have good memories or good sources. Sometimes the sources know things they’re saying aren’t exactly right. And finally, sometimes writers get mixed up or go to bad sources. It’s our job as an editor to check those thing out and to put them in the correct context so that the reader understands the information clearly. Look at things in a different way (say on a print out or in a bigger font) to note things in a story you don’t see on the first or second read. I went to a lot of good sessions at the conference, on topics such as bias in language, style guidelines, the misinformation ecosystem, engagement tactics. But the session that was the most fun, by far, was done by my KU colleague Lisa McLendon and was on diagramming sentences. I remember diagramming sentences as a kid, and I’m not sure I thought it was a fun endeavor. But Lisa and about 120 enthusiastic word nerds made this session a blast. More power to the idea of making a line equation out of a sentence. Finally, I became well read last week. And I mean that in the opposite way I would normally use the term. I actually read no books over the course of the conference, but a lot of people read something I wrote. I got the opportunity on Tuesday to interview AP Stylebook editor Paula Froke and Colleen Newvine of the AP Stylebook team in advance of the AP’s annual style update announcement at the ACES conference. The AP Stylebook’s most talked-about change was allowing, for the first time, use of “they” as a singular pronoun. They recommend writing around its use if possible but they stress clarity first and acknowledge that the singular they can be used. Many publications had already made such a ruling in their house style and both the AP and Chicago Manual of Style are addressing the singular they in their stylebooks this year. The story I wrote was well read. From 3 p.m. Friday when it was posted to 3 p.m. Monday, it already had more than 36,000 page views on the ACES website (www.copydesk.org), making it the most-read ACES story since we started tracking web traffic. If you find any typos in it, let me know. As an editor, I hate to make mistakes as a writer, but I also know it happens.